As everyone knows, teen bullying has become a sometimes-lethal epidemic in middle and high schools across the country. Teen bullying is not a new phenomenon. Anyone reading this article might have been affected by it in some way while struggling through the teen years. We remember the hurt and the embarrassment inflicted on those not able to stand up for themselves. But rarely were pictures involved. In today’s social media/Internet age, teen bullying has taken on endemic proportions. There are so many victims and the pain is much more public. How often do we hear about teen suicides resulting from an online incident involving bullying. And it all starts with a picture. 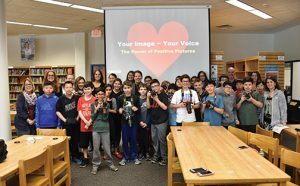 The Imaging Alliance kicked off its Your Images/Your Voice program aimed at fighting teen bullying at Jericho Middle School, New York. Just think about it. We’re all in the business of promoting fond family memories that will document our lives for future generations. But we’re also enablers who sell products that can cause deep destruction to the lives of young teens. These are primarily negative images, meant to hurt or embarrass teens when they are at their most vulnerable. While oftentimes it starts out as a joke, it can lead to severe circumstances with lasting affects. Of course we don’t condone this. And it’s easy to say that mobile phones are the real culprit. With all this being said, we can either turn a blind eye or we can make real contributions to help teach kids about the harm negative images can do—versus the good that positive images can bring. I bring this up because the Imaging Alliance began a pilot program this month for middle school teens. The program is called Your Images/Your Voice. The goal is to teach 12- to 14-year-old kids that while pictures can certainly hurt people, they can also just as easily bring joy and understanding when they tell a positive story. The five-week program began with simple instruction on using the DSLRs on loan from Nikon. 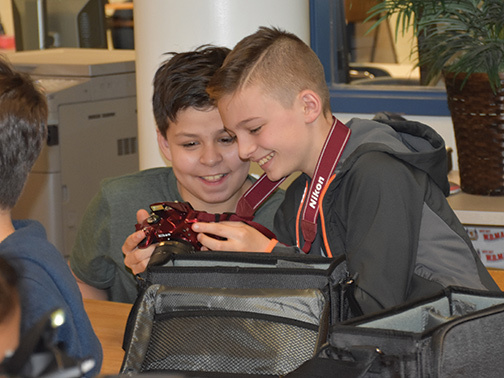 Working with Jericho, New York, middle school teachers, guidance counselors and administrators, the Alliance developed this program to teach sixth and seventh graders about telling positive stories with real cameras. During the five-week program, the Alliance is asking these kids to take pictures that visually demonstrate each of five words: unity, empathy, pride, perseverance and belonging. The 25 kids in the program will build a photo book for their school, with 15 pictures representing each word. The result will be a beautiful photo book that teaches kids how positive images can tell incredible stories. 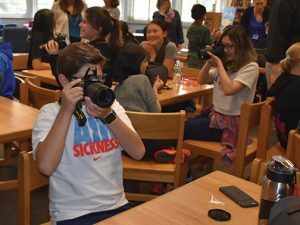 Nikon agreed to lend the school 15 entry-level DSLRs for the five-week period, and the program kicked off with a two-hour presentation. The kids were shown the importance of positive images, and they were taught the simple use of the camera. Nikon’s Mike Corrado gave a wonderful presentation about how challenging and rewarding it is to tell stories through the power of photography and the many images he’s shot over the years. These include his moving documentation of kids at a local Ronald McDonald House, where he’s used his tremendous talents to help kids as they go through cancer treatments. 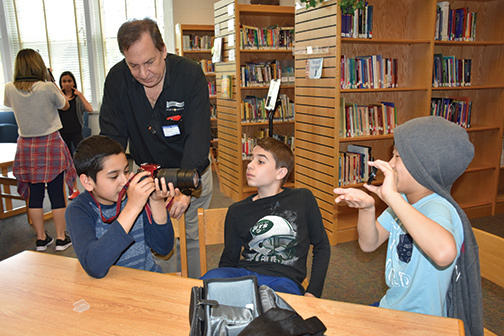 Camera Land’s Jeff Mantell teaches sixth and seventh graders how to use real cameras. 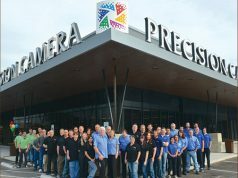 Joel Paymer and his team from Camera Land, located in Old Bethpage, New York, are also participating in the program. They are lending a hand in helping to teach the kids about photography. The Alliance’s goal is to turn this into a national program, whereby camera dealers are teamed with their local middle school to teach kids the meaning of positive imaging. Just imagine a national program created by our industry to help fight teen bullying. The 25 kids in the pilot program will build a photo book for their school of positive images. The pilot will be completed in June. The Imaging Alliance will then take the lessons learned to kick off a national program this fall. 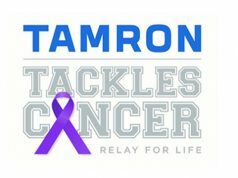 This is a wonderful way for manufacturers and dealers across the country to become involved with fighting teen bullying. If you are interested in participating in this program, please contact Michelle Tramantano, program director of the Imaging Alliance, at michelle@theimagingalliance.com. 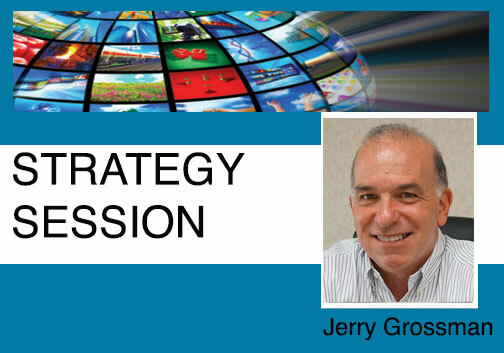 Editor’s Note: Jerry Grossman is the executive director of the Imaging Alliance.